Kitchen has a lot to store because of its function. Hence, sometimes it is not easy to organize it with the lot of things you need for preparation and cooking the food. The good news is you can make you kitchen clutter-free by doing some ways. Below are some kitchen organizing ideas that we think could help make your kitchen in order. Sometimes bottles of spices array the countertop and make it look crowded. 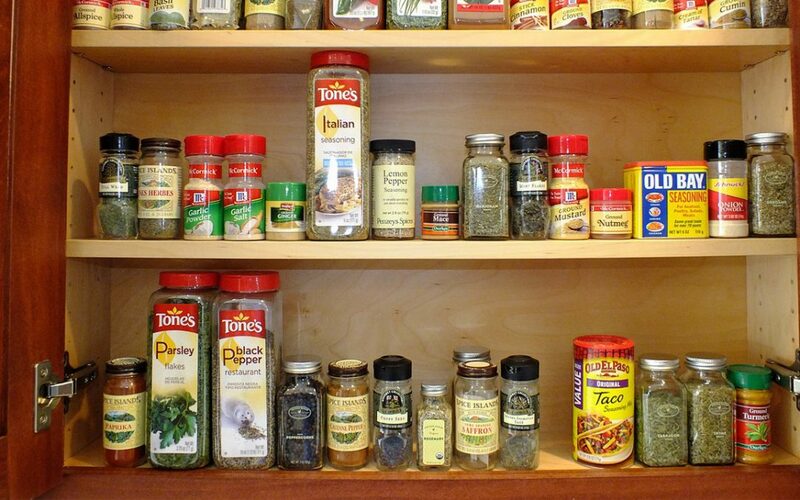 To avoid this, you buy a set of the magnetic spice rack and place it on the side of your fridge. You could also place it on a sheet of tin that you can hang inside your cabinet. The sides of the end of cabinets are often unoccupied. You may buy additional shelves and put them off the sides of the cabinets. These are added storage space for mugs, spices, and recipe books, among others. To expand your counter, you may use a large cutting board that can be placed above the kitchen sink. This thing is ideal to maximise your cramped kitchen space. You can utilize the cabinet under the sink by hanging an inexpensive shoe organizer on the inside cabinet door. Put things such as sponge, gloves, spray bottle, a small rag, cleaning brush, and many more. You may use the two cabinet doors under the sink. Rolling cabinet storage is very useful in the lower cabinets or under the sink. You can put many things on it including plastic food containers, aluminum foil, baking sheet, and other cleaning materials. Your upper cabinets can also be used by hanging corkboards. Get hooks and hang some kitchen utensils, measuring cups, or pin recipes. You can turn your corner lower cabinets into a pot rack. And to make it more accessible, you may buy a Lazy Susan and place kitchen utensils. You can put another shelf on top of your open shelves or under the shelves. There are pre-made shelves and undershelf baskets that you can purchase in store. You may put cups on them for easy pick-up if you like to drink coffee. Buy a dividing file rack and place it in your lower cabinet. Make use of it by placing the baking sheets or cooling rack. A kitchen cart is very convenient and useful. You may place things that you use in your cooking or put kitchen utensils including glasses and cups. It is very handy and portable and can be rolled from kitchen to dining area. Decluttering your kitchen is made easier with the above organizing ideas. Indeed, they will keep your kitchen unified and in order and spare you from mental blocks or headaches.